Throughout the history of the turf, there have been certain horses which have captured the public’s awareness to become fan favourites. These athletes develop a devoted following and in the process become legends. Successful horses have what we humans call charisma, a sense of spiritual power of self confidence and personal belief. Alysheba born on March 3, 1984, was most certainly a very charismatic horse. He captured the public with his determined efforts, his sense of drama from his running style, and from his engaging and inquisitive personality. Alysheba was sired by Calumet Farm’s great Alydar, the only horse to finish second in all three Triple Crown races. Alydar was oh so close to being one of the greatest turf runners in history. Unfortunately for him he was born in the same year as Affirmed, who defeated him in each Triple Crown event. Alydar would become a wonderful sire of seventy-seven stakes winners, many of which were crowned as champions. Alysheba being perhaps his most accomplished and decorated son. Bel Sheba by Lt. Stevens, is the dam of Alysheba. She was stakes placed in her racing career, but upon retirement she not only produced this colt, but also stakes winners Port Master, Alysbelle, Enjoy Plan, and Grabelist. Bel Sheba was bred and owned by Preston Madden, the proprietor of Hamburg Place just outside Lexington Kentucky. Bel Sheba’s sire was a direct grandson of the epoch stallion Nasrullah, while Alydar was out of a daughter of another Nasrullah son (On-And-On), thus making Alysheba inbred to Nasrullah 4×4. Madden sold the Bel Sheba colt at the 1985 Keeneland Summer Yearling sales for $500,000 to Dorothy Scharbauer and her daughter Pam. The Scharbauers sent the young bay colt to the barn of one of America’s foremost trainers, Hall of Fame inductee Jack Van Berg. Under the patient and gifted guidance of Van Berg, Alysheba would grow from being an immature easily distracted colt, into a determined and focused racing dynamo. Right from the day Van Berg took charge of Alysheba, he could sense the talent and potential greatness within his young steed. His new tarinee was prone to distraction, much like a young child in school, and would concentrate on the goings on around him as opposed to the lessons being taught. When he did keep his mind on running, he quite simply flew around the track. The natural ability within Alysheba was waiting to be harnessed, and Van Berg was just the trainer who could tap into such a deep well of talent. Throughout his two year old campaign, Alysheba ran with the inconsistency of an immature child. Sometimes he would duck and weave down the stretch, creating undo extra effort for himself to be able to pass his foes. He did not break his maiden until his third career race, doing so with a lead of eight widening lengths at Turfway Park. Van Berg added blinkers to Alysheba’s equipment in order to get the colt to concentrate on his racing, and not succumb to his inquisitive manner to the goings on around him. Alysheba liked to play, so Van Berg’s patience became Alysheba’s greatest ally in becoming a champion. Van Berg tested Alysheba against stakes company for the rest of his two year old season. Second place finishes in the In Memoriam Stakes and the Breeder’s Futurity, gave the connections great hope. Alysheba next ran in the Breeder’s Cup Juvenile at Santa Anita, finishing third to Capote and Qualify. He made one more start as a two year old, finishing second yet again in the Hollywood Futurity. A lesser trainer would become completely frustrated with such a record of an obviously talented colt, and I’m sure Van Berg did have some pangs of such an emotion. However, he rolled up his sleeves and got to work on teaching Alysheba to grow up and learn to become a winner. Alysheba began his three year old campaign with another frustrating performance, fourth in an allowance race, and then followed up this with another second place in the grade one San Felipe Handicap. Van Berg then had Alysheba checked from head to toe for any kind of physical malady the colt may be experiencing. An entrapped epiglottis was discovered, which required minor surgery to correct. With this minor problem solved, the team could now go forth toward a date in the big event on the calendar on the first Saturday in May, the Kentucky Derby. A tightening race would be needed before the Derby. Van Berg entered Alysheba in the Blue Grass Stakes at Keeneland, which was then run ten days prior to the big Churchill Downs race. Alysheba won his first stakes race, but NOT SO FAST!! His erratic running resurfaced and he was disqualified and placed third behind Leo Castelli. Alysheba had interfered with Leo Castelli n the stretch. Second placed finisher War was declared the winner. The Blue Grass Stakes was the first time jockey Chris McCarron rode Alysheba, and another beautiful friendship was born. Seventeen horses were entered in the 1987 Kentucky Derby. The field was actually quite stellar as in the field were the aforementioned War and Leo Castelli, as well as Bet Twice, Gulch, Cryptoclearance, Capote the reigning two year old champion and Demon’s Begone, who was sent to the post as the race favourite. The race was full of intrigue and talking points. Around the first turn, War was squeezed on the rail and had to check his stride, while Capote led the field through a very quick 45:2/5 half mile. Alysheba ran toward the back of the field, some ten lengths off the pace. As the field came to the far turn, the pack would close ground on Capote, engulfing him as they passed by. Demon’s Begone at this point was last and pulled up. Bet Twice began his run and inherited the lead through the turn and at the top of the stretch while McCarron had Alysheba rolling on the outside gaining ground. Just before the eighth pole as Alysheba was gaining on Bet Twice, he clipped heels with that one and stumbled, almost falling. Alysheba gathered himself quickly and set down after Bet Twice. Weaving in and out down the stretch, Alysheba caught Bet Twice on the outside and then pulled away for a three quarter length victory. The son of Alydar had picked one of the most prestigious races to earn his first official stakes win, and in doing so he avenged his sire’s loss nine years earlier. He now began his ascent as one of the most cherished horses in America. Even though Alysheba continued to run erratically down the stretch, it had become apparent to Van Berg and the rest of the Derby winner’s connections that the colt was growing up. He had now developed a taste for winning, which he dined out on many more times before all was said and done. The race also was the second meeting between Alysheba and a rival he would face many more times in his career in the big talented bay Bet Twice. The Preakness Stakes pitted both combatants in a stirring stretch duel in which Alysheba wore down Bet Twice through the home lane to win the second Triple Crown jewel by half a length. Alysheba ran straight and true in this stretch run, confirming that he indeed was learning to harness his talent. The public were all in for Alysheba to win the Belmont Stakes and thus the Triple Crown. He was the new darling of racing, and as it later become apparent, this would not be a passing infatuation. Bet Twice gained a measure of revenge over Alysheba in winning the Belmont Stakes. Alysheba finished fourth behind Cryptoclearance and Gulch as well as the winner. The rivalry of Alysheba and Bet Twice became a great source of conjecture in the press. Van Berg gave Alysheba some rest before bringing him out for the Haskell Invitational two months later. Bet Twice held off his rival in the stretch to win the race. Alysheba had lost ground coming into the stretch and could not make up the difference before the wire. Lost Code ran a very game third. The Travers Stakes was next at historic Saratoga. This race is known as the mid-summer classic and has seen many an upset during its storied history. On a sloppy, slippery surface, Alysheba had difficulty getting hold of the greasy track. Java Gold came splashing down the home stretch to beat Cryptoclearance, with Polish Navy third. The Derby/Preakness winner ended up in sixth some fifteen lengths behind. One month later Alysheba redeemed himself in the Super Derby at Louisiana Downs, then a prestigious grade one race. He took his customary place near the back, well off from the pace. In his usual manner he gained ground along the back stretch and then powered around the far turn to unleash his stretch run. McCarron had the bay colt up to the leader Candi’s Gold by the sixteenth pole and rode on in front to win by half a length. This performance set up Alysheba for his start in the upcoming Breeder’s Cup Classic, and a Hollywood Park date with the previous year’s Kentucky Derby winner Ferdinand. The performance the leading three year old gave in this race, his first such event against older horses, added to his growing popularity with racing fans. In one of the most thrilling BC Classics run, Alysheba was gaining on the big chestnut son of Nijinsky but ran out of real-estate before the finish line, thus being denied by Ferdinand the win. This was a race for the ages. Alysheba, who by now was a thorough and professional race horse, had just missed to a worthy and more experienced rival. Seldom do two horses gain the complete admiration from the same race in the hearts of racing fans, but in the case of the 1987 Breeder’s Cup Classic, both the winner Ferdinand and the second place finisher Alysheba did so. Guts and glory on display. Racing at its finest. Ferdinand would be voted as the Eclipse Award horse of the year, the length of a few inches separating Alysheba from winning the big prize. Alysheba took the Eclipse Award as the top three year old. Jack Van Berg rested his champion until his début as a four year old of February 7, 1988 at Santa Anita. He sent the horse straight into the grade one Strub Stakes at a mile and a quarter. Alysheba beat old foes Candi’s Gold and On The Line, beginning a three race win streak. Next up was the “Big Cap”, the Santa Anita Handicap. Alysheba would get his revenge from Ferdinand, winning the race by a half length. He then beat Ferdinand again in the follow up race at Santa Anita, the San Bernardino Handicap by a nose. Pimlico decided to resurrect the historic Pimlico Special, the famous race in which Seabiscuit defeated War Admiral. Alysheba could only manage a fourth place finish however in the revival of this famous event, beaten by rival Bet Twice who was getting a three pound weight advantage. Lost Code and Cryptoclearance were also in the race with less of an impost as our hero. Seven weeks later back in California, Alysheba finished second to Cutlass Reality in the Hollywood Gold Cup. Ferdinand was third. As it turned out, this was the last race in which our subject did not win. This was also the final race Alysheba would wear blinkers. Two months later at Monmouth Park, Alysheba won the Philip Iselin Handicap over familiar foes Bet Twice and Gulch, giving weight to both. Three weeks later he took the prestigious Woodward Stakes at Belmont over Forty Niner, giving that rival seven pounds. Alysheba then followed up with another grade one victory in the Meadowlands Cup over Slew City Slew. Slew City Slew had an eleven pound weight advantage. The last two races were both run in track record time. All of this was in preparation for another shot at the Breeder’s Cup Classic, due to be run this year at Churchill Downs for the first time. The field drew some stellar entrants. Three year olds Forty Niner, Seeking The Gold and Lively One, fellow four year olds Cryptoclearance and Slew City Slew, five year olds Waquoit and Personal Flag as well as the six year old Cutlass Reality would all be the challengers to Alysheba. Another challenger to test Alysheba was also present, the weather. Rain had descended on Louisville the day before, creating a very muddy track. Alysheba had had his worst performances on such surfaces in his career. McCarron has stated that if his mount has one thing he thoroughly dislikes, it is that he does not like mud hitting him in face. Both he and Van Berg walked the track on the morning of race day and were surprised to see that the track was quite firm underneath. The temperature was not on the warm side but the surface was drying quicker than expected. With the BC Classic to be run as the eleventh race on the day’s card, there would be a good chance that the track might dry out more, providing that the rains did not reappear. There was another challenger to Alysheba, for the Eclipse Horse of the Year Award, but she was not in the same race as he. Personal Ensign was on a mission to finish her racing career undefeated, and was entered in the Breeder’s Cup Distaff. This race would be run just prior to the Classic. If she won her race and Alysheba lost his, then she could lay a strong claim to the big year end award. There was much at stake on this Breeder’s Cup day. Personal Ensign won her race in dramatic late fashion, to stake her claim as horse of the year. Now it was up to Alysheba to make his statement. The old saying ”When the going gets tough, the tough get going” is the apropos description of the performance Alysheba blessed the turf world with at Churchill Downs this day. Right after the post parade, snow, yes that’s right snow, began falling lightly on Churchill Downs adding another element to the challenges awaiting Alysheba on this day. With darkness descending on the famous track, Alysheba powered his way down the stretch, catching the leaders Waquoit and Slew City Slew and then held off a determined run from Seeking The Gold to win the Classic by three quarters of a length. As he crossed the finish line, announcer Tom Durkin proclaimed Alysheba as “America’s Horse”’ a fitting and completely accurate description of the great bay. Alysheba had saved his best for his last race, beating not only a stellar field, but also the elements and a on a surface type that was not to his best liking. That is how one would define greatness. Alysheba earned the Eclipse Award Horse of the Year, and retirement to stud at Lane’s End in Versailles Kentucky. His great success on the track did not carry over to his stud career however. As with most of the sons of Alydar, there was only limited stakes winners sired. Alysheba sired only eighteen stakes winners over his entire career as a stud. One of his get however was the very good and consistent champion Alywow, Canadian horse of the year in 1994. Alywow won of the Breeders Stakes and Natalma Stakes among her seven wins from nineteen starts. She placed in ten more races, only missing the board twice in her career. Due to his slow start as a sire, Alysheba was sold to King Abdullah in Saudi Arabia for transfer to his stud in 2000. Upon his retirement from breeding, the King would then generously gift Alysheba back to the US in the fall of 2007. Alysheba went to the Kentucky Horse Park, were he greeted his many fans and admirers who had come to visit him. Alysheba always the ham, entertained his guests with his charm and sense of joie de vie. Jack Van Berg always said that Alysheba was the best horse he ever had in his training career. This is a career that has seen many wonderful and talented champions and race winners. When Van Berg retired, he was the all time leading trainer of winners, in turf history. Van Berg knew as soon as he set eyes on Alysheba that this colt will be something special. In his words “When we saw him as a yearling he just stuck out, like a diamond in a rock pile”. Alysheba won ten grade one stakes races, placed in seven more and was the leading money winning Thoroughbred when he retired from racing. He won two classics, a Breeder’s Cup, set track records, and faced the best of two generations of top Thoroughbreds during his illustrious career. He took his time to learn his craft, but when he did, he was truly exciting to watch. A few months after his arrival back in the US, Alysheba had a serious fall in his stall. He was unable to get up. He was suffering from a degenerative spinal condition which led to ataxia and would cause instability. After his fall, veterinarians at the Hagyard Equine Medical Institute were summoned to evaluate his condition. Dr. Nathan Slovis headed the team. However it became painfully clear that Alysheba had sustained an injury that he could not possibly recover from. The decision was made to end his pain and let the great horse go out with dignity. 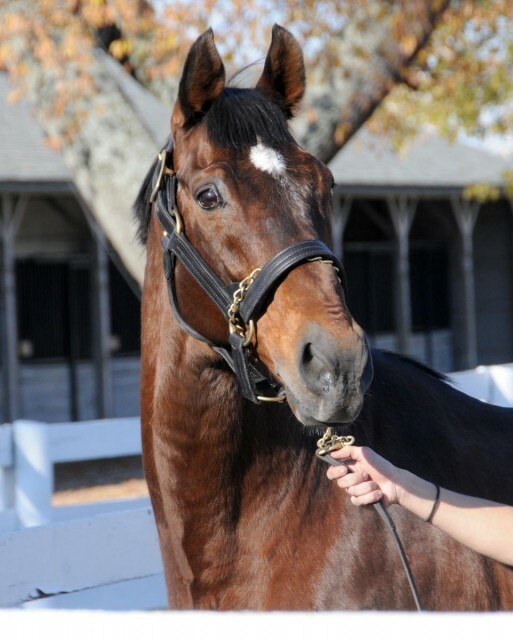 Alysheba was humanly euthanized on March 27, 2009. He is buried at the Kentucky Horse Park in the Hall Of Champions, across from the great John Henry. Alysheba was a very intelligent horse. He enjoyed people, and people enjoyed him. He was a sound horse, very fast and very competitive on the track. Race fans could not avoid falling for this horse. His infectious personality and his way of winning his races brought people to his corner. In other words, ALYSHEBA HAD CHARISMA!! As usual, very well written about a great horse. Van Berg really loved Alysheba, and his stall was closest to his office. When Alysheba would hear Jack come to his office, he would holler and stamp, and create a fuss until Jack came to say hi, and of course bring peppermints. When Alysheba came home to the Horse Park, Jack Van Berg and Chris McCarron were there to greet him. and Jack went up to him as he walked by, and gave him his peppermints; as he took his mints, Alysheba looked at Jack, and turned his head to follow him, with recognition. Jack said that Alysheba and Bet Twice would nicker to each other, every time they would see each other..
Really enjoyed reading your comments, Roberta Gonzalez – especially your 1st hand experience with Alysheba in Jack’s barn! I was “introduced” to Alysheba, by Jack, at Pimlico prior to the Preakness. Jack claimed I could “take a nap” in the horse’s stall – – he was that gentle. No other horse has ever made as big an impression on me as Alysheba in that post-parade – his ultimate dignity & confidence captured me forever. His career that followed was breathtaking – as were his superb connections! Always in my heart! I was at Hollywood Park for the Breeders Cup Classic and had the perfect view for the start of the race as the starting gate was right in front of me as I stood at the rail. As big as life was Alysheba with Chris McCarron up and Ferdinand with Bill Shoemaker. What a great race they delivered. I loved Alysheba as much as I had his father. As a young girl, I fell in love with horses and horse racing. This group is the group of my fondest first memories. Wonderful story. Thank you! It’s been a long time. I enjoyed reading about Alysheba all over again! My favorite horses Seattle Slew. Alydar, Alysheba, Lava Man, Zenyatta, and California Chrome, all have the same qualities, of Charisma, Intelligence, and Courage! I fell in love with Ziconic, Zenyatta’s second foal, and felt he was handled all wrong. He was built like his father, and just couldn’t run in the same style as his mother. He could dance like his mother, and I was hoping that when he lost interest in racing they would give him a chance like they did his brother Coz, and maybe do dressage or 3 day eventing; he is a beautiful chestnut. I have heard rumors that he is going to South Korea for stud duty. Have you heard anything? I really hope it’s not true! Good to hear from you again!!! !